The proliferation of the use of lithography in the U.S. in the mid-nineteenth century dramatically changed the world of popular visual art. The first lithograph in America had been made in Philadelphia by Bass Otis in 1818. Unlike woodblocks or etching, the process could cheaply and easily produce multiple copies of an image which retained the subtleties of a drawing or painting. Posters, books, advertising cards and even sheet music, were now alive with images of people, places and things both familiar and exotic. 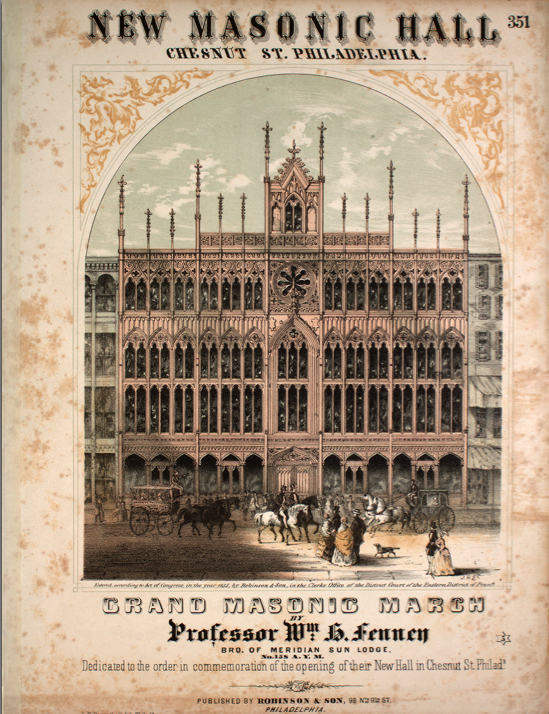 Lithographed sheet music covers were an odd marriage of musical composition and advertising; a union that produced a lively and spontaneous record of the mid-nineteenth century streetscape. Below are some of those contemporary views of Philadelphia from dance music published here from 1836 to 1861. I like to imagine them propped up on the pianos that stood in the parlors of so many Philadelphia rowhouses of the time, part of the reassuring iconography of the middle class city. The view is from the first landing on the steps leading up Faire Mount where the Art Museum stands today. We are looking south along the Schuylkill at the fountain just below the Water Works, with the upper Ferry Bridge beyond and Harding’s Hotel on the other bank. By this time Fairmount Park was being celebrated as a natural resource for residents and tourists and was on its way to becoming the largest municipal park in the country. The music is for a quadrille, a ballroom dance done in a square by four couples, similar to modern square dancing. 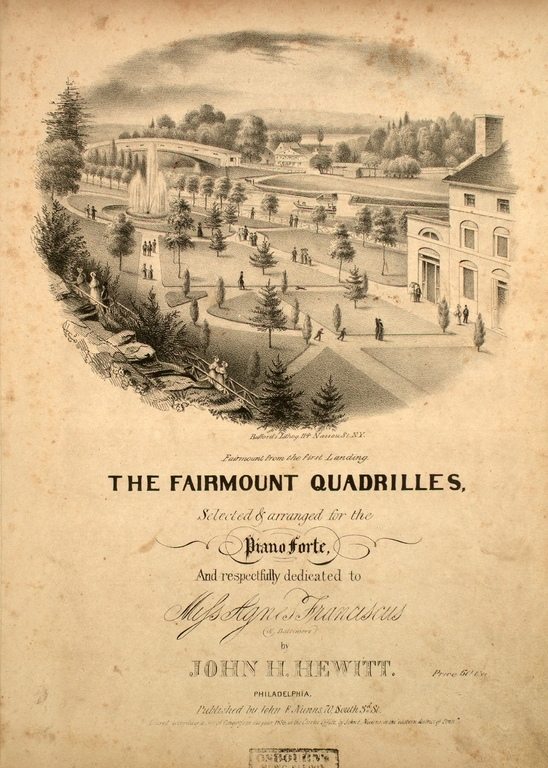 Inside are instructions for doing the particular set of figures for the “Fairmount Quadrilles.” The quadrille had been introduced to America in the early 19th century and was reaching the height of its popularity when this music was published. Quadrille parties blossomed in public halls and in fashionable private homes all over the city. This is the second location of the Public Ledger Building, at the SW corner of 3rd and Chestnut Streets. The Ledger had begun publishing in 1836, as the city’s first penny paper. The street corner in the image is crowded with top-hatted Philadelphia gentlemen eager to read the latest headlines. One lad stands amusingly on tiptoe to read over someone’s shoulder. The last home of the Ledger, built in 1921 on the SW corner of 6th and Chestnut Streets, is still standing. 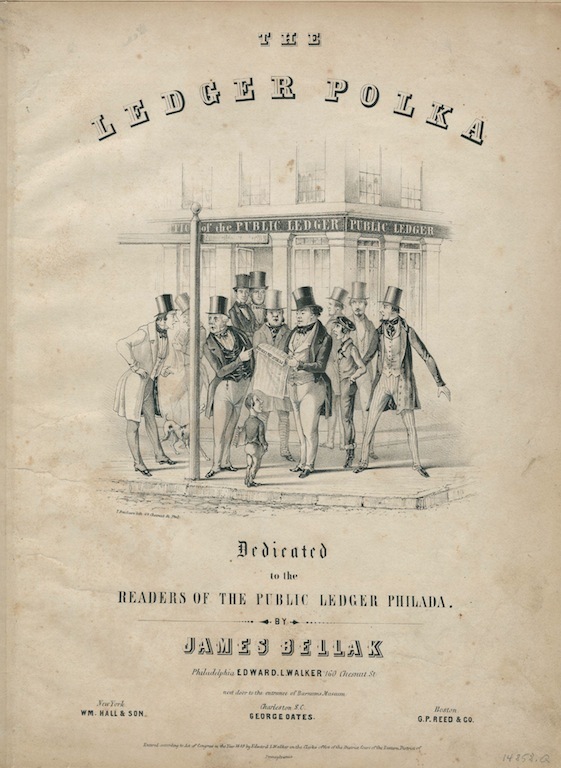 The eastern European polka invaded Paris and London ballrooms in 1844 and “polkamania” swept Philadelphia that same year. By the fall, local belles were wearing fashionable polka dots and polka jackets and the city’s dance teachers were vying with each other to teach “the celebrated and real dance called the Polka” in the “latest, most elegant and brilliant style as danced in the best circles in Paris and London.” Would anything less do for Philadelphians? 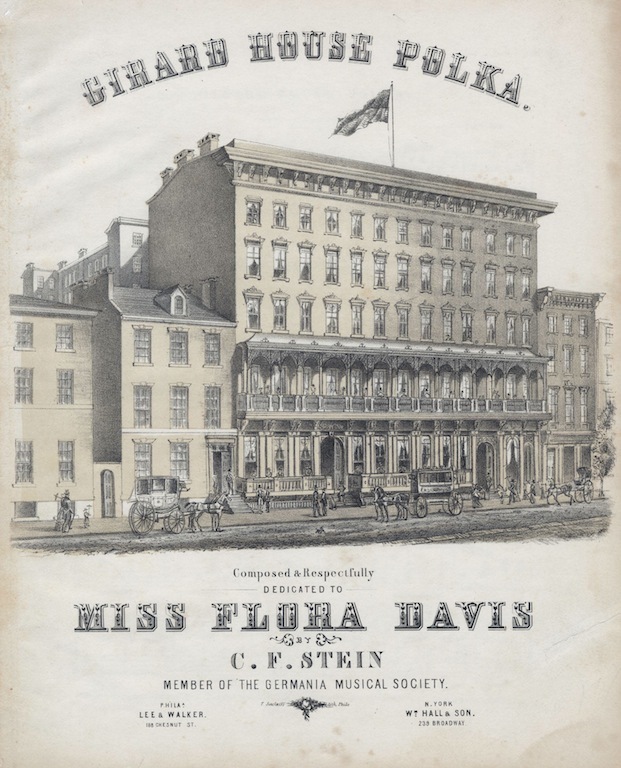 The Girard House, on the north side Chestnut Street near 9th, across from the Continental Hotel on the south side, had just opened in 1852 when this sheet music was published. The building was designed by John McArthur Jr., architect of Philadelphia City Hall. The hotel was very popular with European visitors; William Makepeace Thackeray stayed there the following year, 1853. In 1861 the Girard was commandeered as a uniform sewing factory and barracks for Union soldiers. As for the1850s polka, Philadelphia dance master Charles Durang said of it: “There is only one Polka known or recognized in the fashionable world. ; but the style of dancing it varies considerably. The most elegant people, and the best dancers, always dance it in a quiet, easy style; and those gentleman who rush and romp about, dragging their partners with them until they became red in the face and covered with the dewdrops of a high corporeal temperature, are both bad dancers, and men of very little good breeding.” Indeed. The Masons had moved from away this location earlier, in 1835, at the height of anti-masonic sentiment in Philadelphia. They were able to recover this property later and erected this magnificent Gothic structure here, dedicating it in September of 1855. The street level was rented for commercial space and the large assembly hall inside was used for lectures and balls. The interior ornaments were done by Joseph Bailey, whose most famous work is the statue of George Washington outside Independence Hall. The Masons moved out of the building when their new hall was completed next to City Hall on north Broad Street in 1879. The site continued to be used as a public venue until it burned in 1886. The Grand March or Polonaise was a prelude to many formal balls in the mid-nineteenth century. Couples would enter the ballroom in a line, promenade around the room, separate and rejoin, walking various figures and patterns at the whim of the lead couple. More than a dance, it was a chance to see and be seen. The venerable Arch St. Theatre, designed by William Strickland, opened in 1828. Mrs. John (Louisa Lane) Drew, to whom this musical composition is dedicated, took over the management in 1861 and ran it as one of the nation’s leading stock companies for three decades. Louisa Lane Drew was the grandmother of the three Barrymores, Lionel, John and Ethel and the great-great-grandmother of Actress Drew Barrymore. John Wilkes Booth was perhaps the Arch St. Theatre’s most infamous company member. 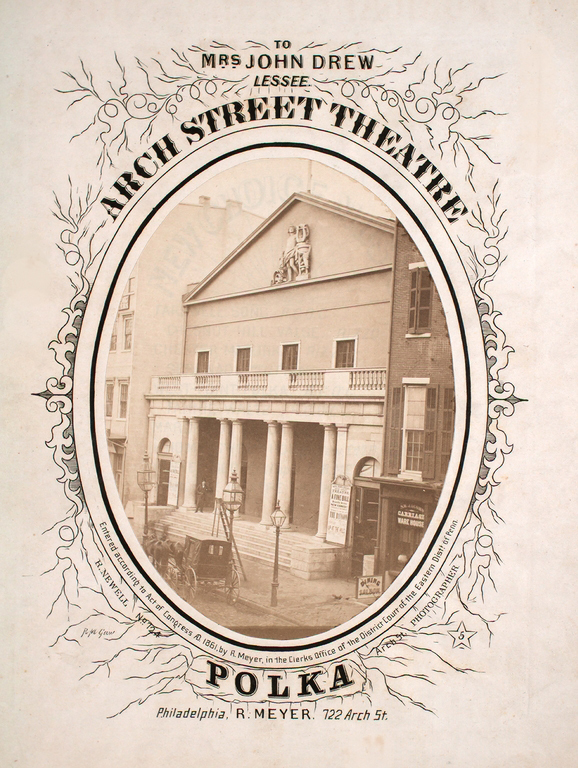 By the end of the 19th century the Arch Street Theatre was home first to German language productions, then Yiddish. It was razed in the 1930s.